The Harborview Nantucket is a fantastic hybrid of renting one of the most beautifully designed Nantucket cottages you can while enjoying a boutique hotel. 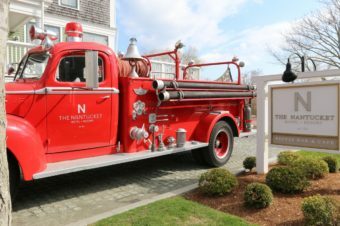 Offering multiple on-site concierge services to its few pampered guests, it’s Scout Hotel‘s premiere Nantucket property. Nantucket is a unique market for accommodations for families. There are several bed-and-breakfasts and smaller inns not welcoming families, and is, ironically one of the more expensive destinations to vacation where room service isn’t standard anywhere. Nantucket is the American version of Harbour Island, one of my longtime favorites in the Bahamas. Sun setting behind Harborview Nantucket. With children, the best choice is to have your own home. Home rental is not for every trip, particularly on a first visit to a new destination. Harborview Nantucket is a wonderful option to help you get to know Nantucket with all of the comforts you could want. 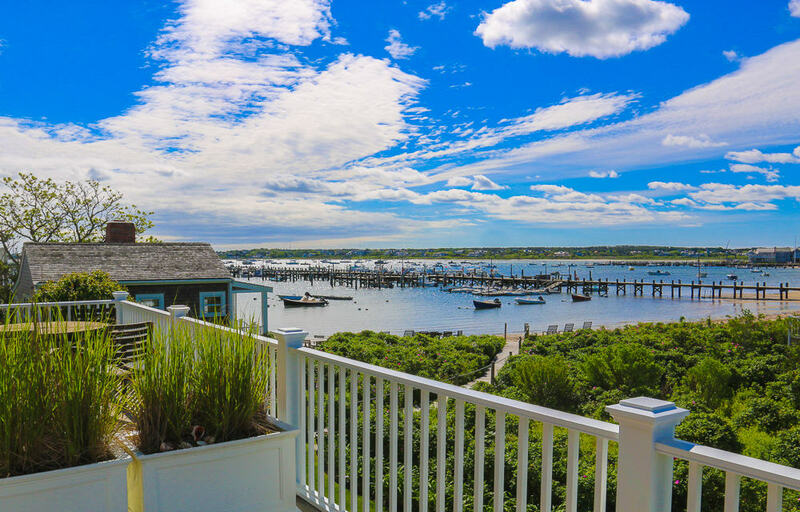 The cottages at Harborview are exceptionally appointed with designs worthy of magazines spreads and amenities replicating those in the most sought-after cottage rentals on the island. Kitchens are appointed with the highest quality appliances and tableware. And every cottage is stocked on arrival with Nantucket’s best locally made wines from Nantucket Vineyard and beers from the Cisco Brewers. Join the Facebook group Luxe Family Trips, where well traveled parents advise one another on luxury family vacations. I loved that Harborview Nantucket offered a pre-arrival grocery service so that our refrigerator was stocked with everything we needed to feed our children breakfast, offer them an arrival snack, and make our morning smoothies. Welcome to the Harborview Nantucket from Nantucket Vineyard. We had a unique unit the contained a sleeping loft with a queen size bed upstairs my children loved climbing the ladder up and down. As long as your kids are old enough to physically master the steps, it was a playful highlight for them. Ample kitchen and dining space in each unit. Pin for all of our luxury family vacation ideas in New England! Our expansive one-bedroom was actually one of the smaller choices at Harborview Nantucket the other buildings offer ways to include side-by-side units where they are ultimately from three to nine bedrooms, and those cottages all offered traditional staircases between levels that may be safer choices for toddlers and babies. Note that Harborview also offers roll-away beds to get the bed configuration just right for a family. Bath amenities are from a local company called Nantucket Looms, whose addictively fragrant products you will stash for your suitcase. I discovered my favorite new travel tip. I found the fragrant soap so addictive I tucked an unopened bar in my suitcase as a sachet. Wi-Fi and television entertainment are top-notch with each individual cottage having its own router so service was strong and complementary. The television in the main room was set up with an incredibly advanced stereo system, and we had the classic comical parenting moment of turning on a blaring television just after we put both our kids to sleep. I’m rather a techie, and yet my husband and I struggled in those 30 seconds to get the TV’s stereo system off and find some sort of mute button, flapping our arms and squirming like we were stepping on hot pavement. I’m not really a fan of cooking on vacation but it takes a really incredible kitchen to make me happy to stay in one and cook meals. This open format kitchen living room and fireplace was one of the nicest kitchens I’ve ever cooked in on vacation. I kept having holiday fantasies of gathering our large family for a Nantucket Thanksgiving cooking away near the wood-burning fireplace. Don’t underestimate the gravity of this endorsement coming from a self-confessed room service addict. Cisco Brewers variety of flavors. The concierge features at the Harborview Nantucket start even before you arrive to ensure that everything is ready for you. They’ll call you for a pre-arrival grocery list and arrange for a ferry or airport pick up to collect you. They are there by text at all hours of the day to answer questions about Wi-Fi or restaurant recommendations. They can arrange clam bakes for your family on the outdoor beach tables, order birthday cakes, or even have meals delivered if you just don’t feel like cooking. Bobby the staff doggie inside the Harbourview office. Loved our room keys at the Harborview Nantucket! The office on site has staff ready to assist in all services for your Nantucket vacation. It was a very happy birthday to me at Harborview Nantucket. The concierge service also recommended Nanny Tucket, the island’s largest babysitting service that was established in 2008. Nanny Tucket is unique for a babysitting service in that it has evolved and adapted for the needs of Nantucket’s visitors and can arrange for event staff, private chefs, and other people who can create and exceptionally comfortable Nantucket vacation with their All Hands On Deck program for on hire assistants. Nanny Tucket shares offices with the island’s baby gear rental company, Petite Travelers of Nantucket, so it’s important to note for parents of babies that everything can be waiting for you at Harborview Nantucket without the need of flying or arriving by ferry with car seats, strollers, playpens, jumperoos, or diaper genies. Both companies should be added to your speed dial if you have kids under 3. If your stay is during the months of July and August, it’s recommended that you reach out to them close to the same time that you book your summer rentals and make your transportation choices. Sitters are in high demand during Nantucket’s busiest social season. The location of the Harborview Nantucket is really exactly where you want to be, particularly if you want to be car-free for your Nantucket vacation. It’s within walking distance to town center and steps from the bus stops for the island’s bus service. Handlebar Cafe has a Bark Bar for local and visiting doggies. The island’s grocery store is steps away, as is Handlebar Café where most of the locals will come in, grab a morning coffee, and go on their merry way each morning. As its name indicates the Harborview Nantucket has harbor views, but also a beautiful little beach with kayaks and windsurfing equipment available for guests. We enjoyed many walks along the beach at all hours during our stay. We had the good fortune of visiting during the Horse shoe crab mating season which my children found fascinating. I would sneak out of our cottage every morning while everyone else was sleeping and walk out as far as I could on the docks (or are they slips?) to take in the elements of coastal New England beauty: weathered gray shingled buildings, sea gulls, blue waters, and sailboats. The fragrant path to Harborview’s private beach. Good morning from Harborview’s beach. Crabs along the Harbourview beach. The Harborview Nantucket seen from the piers. Kate from Nanny Tucket arrived to take my kids for a few hours. Within easy walking distance they had the choice of the small aquarium on the island and the Whaling Museum, which has a large children’s room for activities and crafts. The mural in the children’s craft room at the Whaling Museum in Nantucket. Craft projects at the Whaling Museum in Nantucket. Bookworks has an extensive children’s section worth browsing. Pinwheels and daffodils decorate a Nantucket window box during the Daffodil festival. Pinwheels in Nantucket carries many favorite designer lines like Tooby Doo, Pink Chicken, and Masala Kids. We adore browsing as a family in Nantucket Bookworks in the town center that has an exceptional children’s book and toy department as well as really creative gift merchandise. It is near Pinwheels, the greatest children’s boutique on the island, jam-packed with several fashion forward clothing brands and Petticoat Row Bakery for some cupcakes. good idea or death wish? Bike rentals are a popular thing for families to do, and we decided to try it this trip. Families who are more seasoned cyclists in cities will be well prepared, but if you’re used to really easy recreational cycling you may find it stressful navigating in the very dense town center until you get further out. I kept waiting for a moment when the space between me, my daughter, and cars whizzing beside us stretched to a comfortable distance, and it never happened. That doesn’t mean those paths don’t exist on the island, but it is not a simple, quick process to reach them. As a result, we kept it short and enjoyed riding to Cliff’s Beach whose entrance is within the residential area. We observed the extensive steps and walkways down the cliff to reach the sandy beach, and I was amused by one resident’s conspicuous gate perched at the end. We walked the vast sandy beaches of the Nantucket sound minutes before a thunderstorm rolled into sight. A gated boardwalk to a Cliff’s Beach residence. On our next visit to Nantucket we might be more ambitious with a greater understanding of what to expect riding in town and head to the Casco brewery Company and nearby farmers’ market where I’ve been told it’s incredibly family-friendly activity to spend the day. Overall, the Harborview Nantucket made a family break incredibly comfortable and convenient. I am still planning that large family gathering this fall in my head. Although we were guests of the Harborview Nantucket, these opinions are entirely my own.